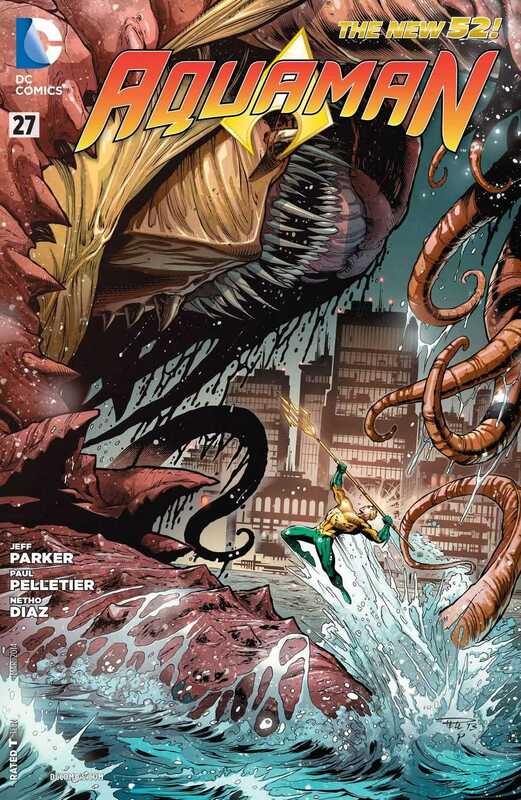 In December Jeff Parker took over writing duties on Aquaman from Geoff Johns. After more than two years of Geoff’s excellent run on the title, which saw the title become one of DC’s best-selling titles in the New 52, we are finally getting a fresh perspective on things and based on #26 and #27 both, I have to say that some really exciting times are ahead for the readers. The previous issue was almost perfect. It met my expectations and it has some great story and art both. This past week’s #27 proved to be another good installment of the series. It wraps up the plot with the Atlantean mythological sea-monster that was terrorising Reykjavik, Iceland and at the same time it furthers the subplot involving the political tensions in Arthur’s advisory council while also giving us more information on Triton Base, a hidden underwater research base created to investigate future potential threats from the underwater kingdom and Aquaman’s relationship to it, among other things. And the art was also good, although the switch at the end with the pencillers created a bit of a WTF moment. There isn’t much different that happens in this issue compared to the previous one. As I said, we see the epic conclusion to Aquaman’s epic fight against the Karaqan, a monster from the most ancient of Atlantean mythologies. The previous issue set it all up really nicely and what I really liked this time was that Jeff Parker kept his dialogue and narration to a minimum. He let the art tell most of the story while he just gave it the occasional nudge from a story point of view. Given the reverence that the Atlanteans hold for Karaqan as a creature from their myths, and the undercurrent of dissatisfaction that runs through the kingdom’s advisors, there is a lot of drama going on in this issue. Some of the advisors aren’t too happy that just because Karaqan is making a scene on the surface world, that Aquaman has taken upon himself to stop it at any cost. Some of these plot points are an extension of the story that Geoff Johns wove through the title during his run and its nice to see things going on to the next step. On the flip side, we have the situation at Triton Base, where the scientists in charge of the base are observing the goings-on in Reykjavik and are interested only in procuring a sample of the monster for their research. A surprise character makes an appearance during these scenes and its interesting to see how that plays out in this issue, and what it bodes for future issues given the purpose and mission of the Base. I like the multiple plots that Jeff Parker is setting up here, just as Geoff did, and its an approach that is working for me. Jeff is definitely carving out his own piece of the Aquaman lore and the great thing is that he isn’t countering anything that has already been covered in the previous issues. He is moving the story forward and exploring more of Aquaman as a character and Atlantis as a setting. One of the other things we see here, very early on, is the reporter who arrived in Amnesty Bay to do a story on Aquaman but who kept getting stone-walled by the locals who are protecting Aquaman’s privacy. It was a really nice tough to the overall story and in the one page that we see all of this in this issue, I’m very intrigued as to where Jeff is heading with that character. And as for the art, well, Paul Pelletier is excellent as always. His Karaqan is magnificent in every scene he is in and his fight with Aquaman is suitably epic. Back and forth, back and forth, the two keep going each other. Jeff gives Paul lots of opportunities to do some really big scenes and the artist does each and every one of them justice. When the art switches over to Netho Diaz’s pencils, the transition is awkward and confusing. Since the style itself changes, the transition is even more unpalatable. Thankfully, the inks by Sean Parsons and Ruy Jose with the colours by Rod Reis all make up for those deficiencies. I’m not sure why this title needs a second penciller, but I’m somewhat ok with it. With the way that this issue ends, I’m really looking forward to how things pan out in #28 later this month. Should be quite fun! More Aquaman: #0-12, #13-15, #16-21, #22-23, #23.1, #23.2, Annual #1, #25, #26. Posted on February 3, 2014, in General and tagged Aquaman, Arthur Curry, Atlantean Kingdoms, Atlantis, Comics, Comics Review, DC Comics, Jeff Parker, Karaqan, Mera, Monsters, Mythology, Netho Diaz, New 52, Paul Pelletier, Review, Review Central, Rod Reis, Ruy Jose, Sea-Monsters, Sean Parsons, Steve Wands, Superheroes. Bookmark the permalink. 10 Comments.